18. 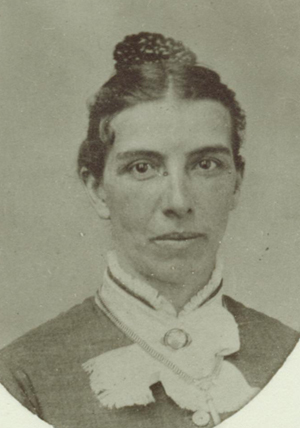 Sarah Catherine3 Cox (Joseph2, John1) was born 23 (or 24) February 1831, in Montgomery, County, Indiana, a daughter of Joseph and Mary (Rue) Cox. She died in California on 25 July (or 22 April) 1883, possibly of a stroke. Sarah married Samuel A. Kirby on 10 August 1848 in Rock Island County, Illinois. Samuel was born on 4 March 1818 at Williamstown, New Jersey and died on 7 June 1894 of heart trouble at his daughter Etta’s in Tulare County, California. Samuel entered 40 acres in Rock Island County on 10 November 1847, the NW4 of the NE4 of section 27, T18N, R1 (S39, 17:6; S135). There were at least three children born to Sarah and Samuel in Illinois, before they started westward in 1855. Rachel Annie, born in 1854, was the only child to survive the trip to California. Mary Josephine was born in Marysville in 1856. Mattie was born in Hydesville in 1865. A biographical sketch states that they moved to Garberville about 1867 and to Hanford, California in 1881 (Paul C. Vandor, History of Fresno County, California 625 [Historic Record Company: Los Angeles, 1919]). In 1870 they were in the census for South Fork township, Humboldt County, in northern California. In 1880, they lived at South Fork, Humboldt County (p. 477B) where Sam was farming. They left Humboldt County on 27 August 1881, removing to Porterville, north of Bakersfield in the San Joaquin Valley, where they arrived on October 1. Much information on the descendants of Sarah (Cox) Kirby was researched and provided by Eleanor (Vanderwalker) Antes.